A book and a day dedicated to discussing with kids how to make their mark on the world…one of our favorite days to celebrate as educator moms! This year Dot Day is on September 15, 2017, are you celebrating? If you’re either an educator or a parent, or both, celebrating this day is important, it’s fun, it’s exciting, it’s international. So if you are planning on celebrating share with us your ideas in the comments below and take a look at some of our ideas too! Parents and educators are great at “stealing ideas”, well maybe let’s say getting inspiration from others, that seems less negative and after all Dot Day is all about positivity! After acquiring the book (I suggest buying because you’re going to want a copy for yourself) we have some ideas that would work in a classroom or at home or even both. As our readers we know you are very creative and could adapt any of the activities below to something that will work for you and the children you are around. 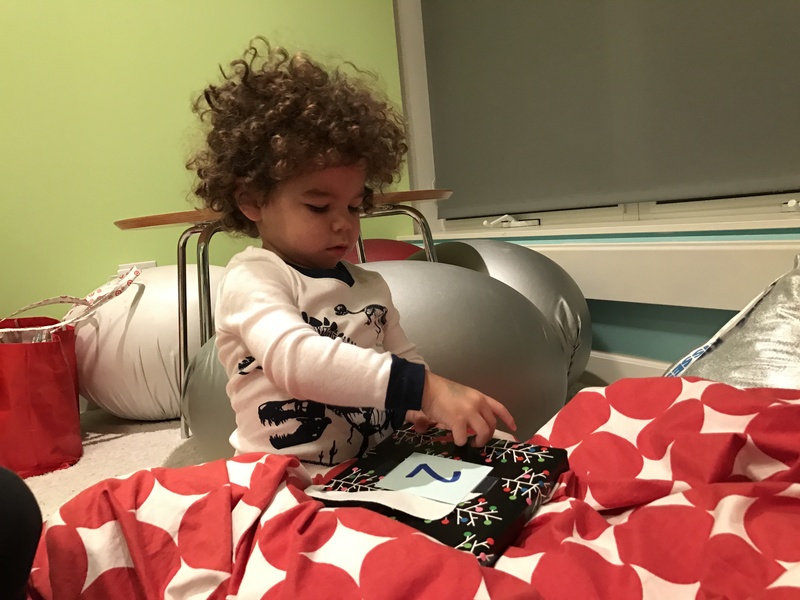 Something that children are often intrigued by (and let’s be honest, adults too) is learning the story behind the creation and idea of a book. So here Peter Reynolds talks about the beginnings of The Dot. It’s about 2 minutes and 45 seconds long so short and sweet. If you haven’t used Wonderopolis in your classroom or at home, it’s time to start! It’s an informative and interesting collection of wonders from science to history to How Do You Connect the Dots, which is perfect for Dot Day! Using this sheet create a collaborative piece of dot art. First make sure children have a variety of writing utensils (pencils, crayons, markers). Give each artist 3 minutes to fill in as many dots as they can by drawing something different in each circle. Some ideas are patterns, doodles, shapes, animals, plants, words, or create something using more than one circle. This is really for the artist to challenge him/herself to draw using the dot as the guide. Anything goes, but try not to give too much direction and let the children be creative. After the three minutes is up you can have the kids share their favorite, the most challenging, the one that took the most time, whichever dot they would like. To make it collaborative you can cut all or a few circles out and glue onto one big sheet of paper so everyone’s dot is represented, everyone has put their mark on the art piece. This activity takes a little pre-work as you need to make sure you’ve downloaded the free app Quiver3D on a device.Then you need to make sure you have enough copies of this Dot Day free download of the specific paper you will need. Then let the kiddos create their own special dot using the paper. The app will make the dot come to life and you and the kids will be enthralled and amazed at what you will see. If you’re in a classroom setting or at home you can take a screenshot of the alive dot to save it. Here’s one that I did a few years back when the app was called ColAR but it’s the same idea. Author AshleyPosted on August 13, 2017 Categories Children's Books, Holidays, Reviews and RecommendationsLeave a comment on How Will You Make Your Mark? 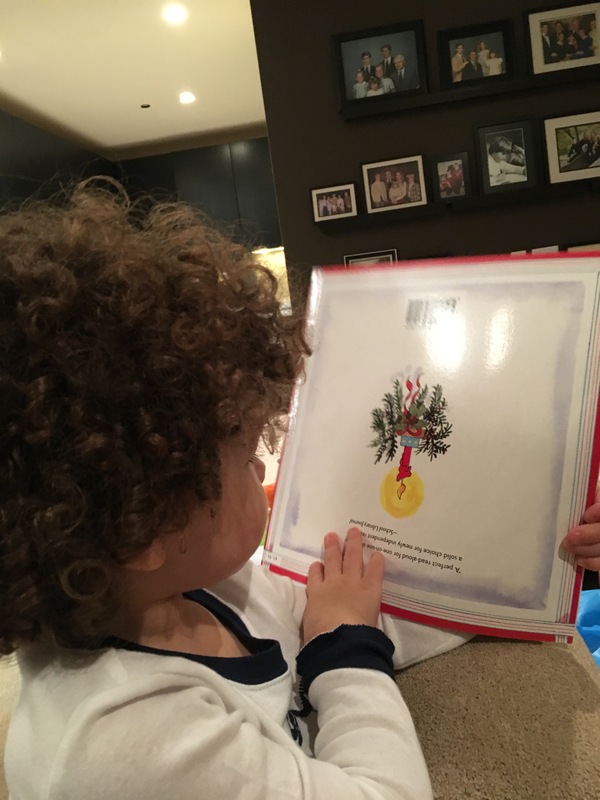 It’s our first year of #holidaybookaday! The theme: open a new December holiday book every night until the end of the year. This could include books about Christmas, Hanukkah, Kwanzaa and New Year’s Eve. 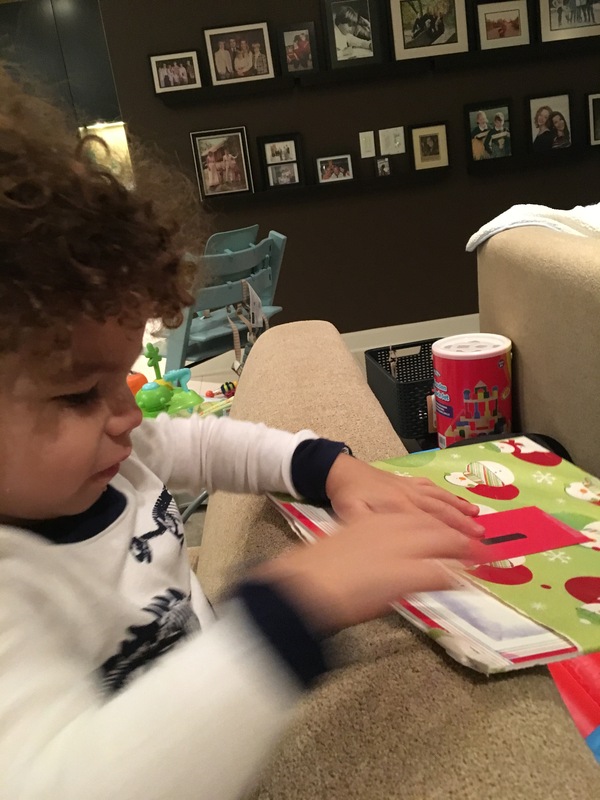 Over this past year my fellow blogger, Kim and I have been adding to a “Countdown to the new year” booklist we created together. 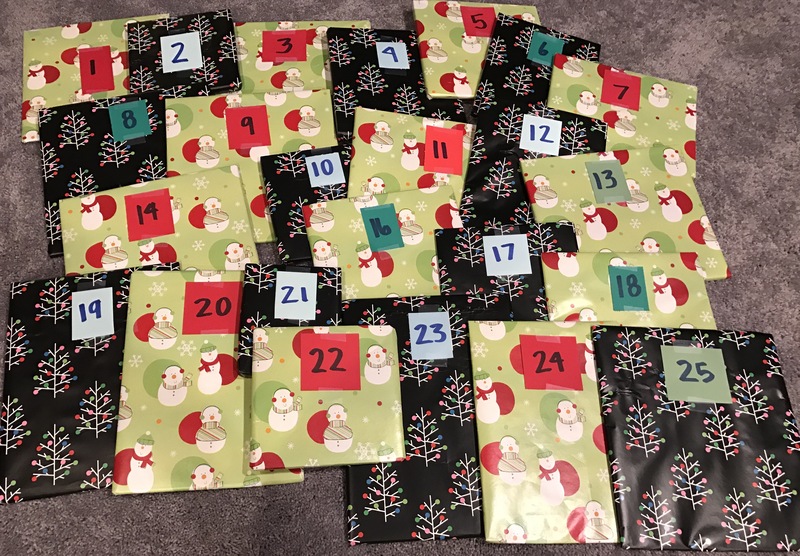 I have been so excited about starting this tradition with my boys that I actually prepared and wrapped all the books prior to even Thanksgiving! J opened up his first book last night because I couldn’t wait to get started. I’m not sure if he will share in my excitement but I’ve been talking it up and I’m hoping he will enjoy this book journey as much as I know I will. What I’m most excited about is having a variety of holidays represented in our book list. I think experiencing these various holidays through stories will bring about many teachable moments. 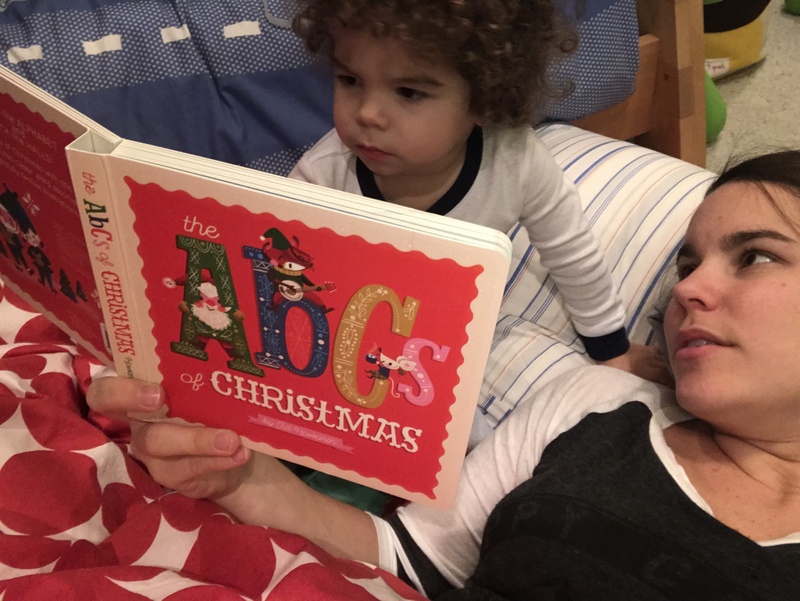 Feel free to join us on this #holidaybookaday journey over the next month by following the hashtag on Instagram! Our books all wrapped and ready!